It’s no secret that hunters really enjoy what they do. So when hunting season comes to a close, some can’t help but want more time to bring home their next trophy. Fortunately for many in pursuit of big game, hunters may have a longer season if a recent state proposal is approved. More than 40 hunting districts across Montana have come together to propose an extension to the dates of the state’s cow elk hunting season. Currently, the season runs from November to February, but if the extended dates are approved, the proposal would open the season to start in August and run until February. Right now there is an elevated population of cow elk across the state, say advocates, according to the Casper Star-Tribune. It’s so high that now the cow elk are showing up in more places than ever before, including numerous acres of privately owned land. The population of elk has thrived in recent years, with numbers now exceeding Montana Fish, Wildlife and Parks’ population objectives in many areas. Wildlife advocates pushing for the extended season say that some kind of action is needed to help keep population levels more manageable. A longer hunting season would also help prevent the numerous elk from destabilizing the regional ecosystem through overgrazing and keep disease and starvation problems from plaguing the elk population. If the extension is approved, it would allow hunters more time to hunt the animals – primarily on private land. The state is currently testing a smaller scale additional season trial through an elk shoulder season. The Star-Tribune reports this season started Nov. 30 and runs through Feb. 15 in some hunting districts near Helena. 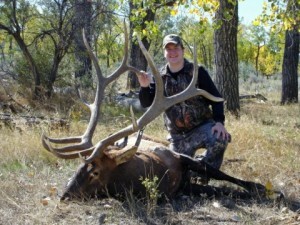 Fort Musselshell Outfitters offers elk hunting trips through Harris Hunts, taking hunters to the mountains of central Montana in search of their trophy elk. Guided by skilled hunters with knowledge of the lands and elk tracking, you’re sure to return home with your next trophy. For more information on guided hunts or to book your trip, call us today at 406-429-2800.